DAY 8 – Tomorrow’s the DAY! This has been so much fun you guys! 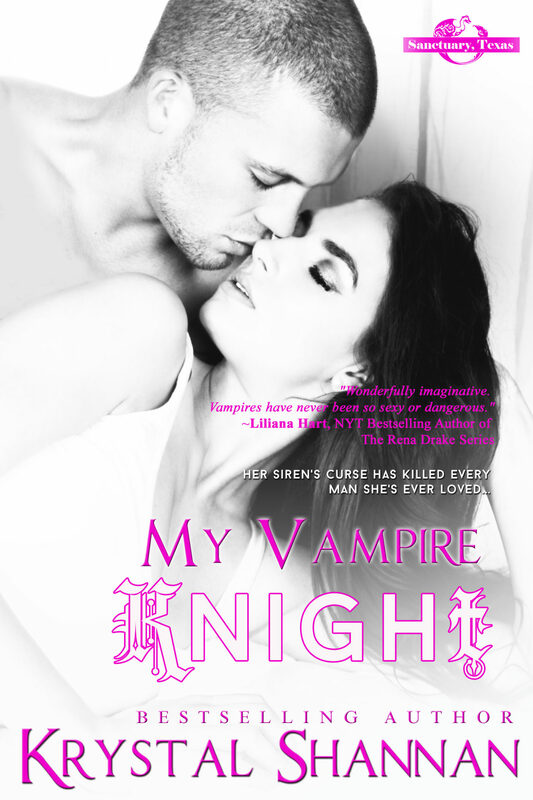 I've loved hearing from you in the comments and your excitement about My Vampire Knight. This book is the culmination of the series. So much love and time and creativity went into these characters and it's such a milestone for me to reach the end. Bittersweet and Exciting in the same breath. I will be sad to see Sanctuary go, but I know you will love what's coming next because I already do and I can't wait to start sharing it with you. I hope you've enjoyed this countdown with me and the wallpapers and giveaways. All 8 days will be open until the end of the month, so you have plenty of time to visit the previous blog posts and enter any of the days you missed and download all the wallpaper goodies. Here's the last wallpaper for the countdown. I really like this one. I hope you will too. DOWNLOAD HERE. Get your copy the second it goes live! I enjoy how the men are with the women. Strong and caring. The emotions you put into your work. I’m a fan of authors who do dual-perspectives. I like getting to read both POVs in your books. You give a much more comprehensive story experience with the way you write than by limiting yourself to one character’s storyline alone. Draw me into the story and make me care about the characters and what happens to them. I enjoy how you can draw me into a story filled with intriguing characters and more. I love how you mix genres – like cowboys with shifters. And the guys are HOT. The paranormal creatures and romance. I have not read any of your books… Yet! But I am really excited about starting one. I really like how your characters are fully developed. I love your paranormal and shifter books! Have not read your books yet but have read good things about them! I love the paranormal aspect of your books. But I have to say I have loved everything I have read by you. The characters are what grabs me, they are fantastic!!!! I love thewell thought out characters and plot lines. Everything that I have read of yours I have thoroughly enjoyed!! I love the paranormal books. Looking forward to see what is next. As a person who’s favorite hobby is to escape into the pages of a fantastic adventure and a lover of all things paranormal, you’re writing is very intriguing to me. I love your characters that are both strong and full of emotion. I also love the wide variety of paranormal types and that each story grabs your attention. I love the Vampires. Your books just keep getting better. The relationship you write between the hero & heroine. Also, how you flesh out the supporting cast. Makes the book better! Well, I guess that would be vampire romance, of course! I love how well thought your stories are and that all the characters and all the stories feel like real love stories…Like something that could happen in the real world. Diversity of your books and characters. I love books that are never like the others…with new beginning, new endings, the strange and unlimited imagination!! I would say the characters. I love when authors write in a way that brings you into the story and you’re so into the book that when you finish it’s hours later. Loved the characters and the world you created for them. That they can pull me out of my reality for a while. The romance of course! But also love the paranormal aspect too. The paranormal romance style with the unique perspective. I haven’t read any yet but they all sound so good! Sanctuary, Texas is one of my favorite series! The different supernatural, Rose bringing everyone together for the greater good of all the races/fae, the love, heartache, the pain, the passion….your books are so deep and real! Especially Sanctuary! This will be another series that will be incredibly difficult to say good bye too! I’ve only had a few books that really made me ugly good bye cry for a series! Thank you Krystal, for your time, love, devotion and passion that you have put into Sanctuary! I like ready both POV’s. And how the characters seem to fit so well together. I love paranormal romances, strong alpha males, and well-written story lines. How could I not love your books? I really love how the secondary characters aren’t “just there”, but that they are a part of the main story between the H and h.
This is the best one yet!! Thank you ! I’m all about the fantasy. I love that you create worlds, and situations that I can be a part of. I have not read many of your books yet but I am working my way thru the Sanctuary Series now and I’m hooked. I love the world you have created and I like how you write from all the characters point of view, I feel that it’s a richer story than just first person. I love your writing passion. I can tell how much you love entertaining your fans with your stories. The characters, They are so well developed that you can relate to them which makes it easier to get sucked in. It’s easy to get invested in the characters. Love the strong characters and paranormal romance.